The trial of Catalan separatist leaders began in Madrid on Tuesday, with 12 politicians charged with the attempted declaration of independence from Spain in 2017. Catalan independence supporters protested in front of the court with signs declaring the 12 to be political prisoners. Spanish nationalist protesters were also out, claiming that the defendants attempted a coup and want to destroy Spain. 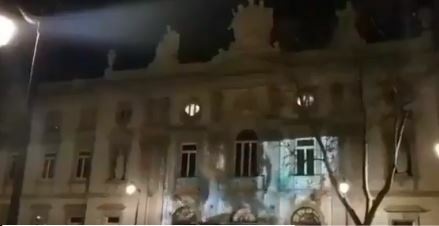 Overnight, protesters projected images of Spanish police brutality against Catalans who voted and protested for independence in 2017, on the building of the court where the 12 political leaders are put to trial. Over the weekend, tens of thousands protested against the Pedro Sanchez Government, after he agreed to begin a conversation with Catalan leaders, although he stopped short of agreeing that it could end with independence for Catalonia. The move threatens to bring down his recently appointed Government.